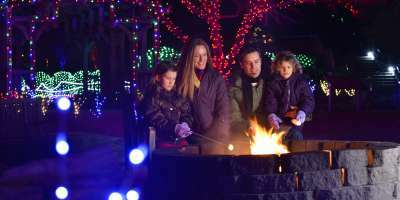 Festive Happenings for Your Holiday Getaway | Asheville, N.C.
Winter Lights at The North Carolina Arboretum is one of the newest holiday traditions in Asheville. From mid-November through December, nearly 500,000 LED lights enhance the natural beauty of the gardens. Advance tickets are a must for this one. Children of all ages will believe in the magic of Christmas after a ride on The Polar Express on the Great Smoky Mountains Railroad. Faces light up as the train arrives at the North Pole to pick up Santa. Along the way, enjoy music, cocoa, singing and storytelling. And, take home your own silver sleigh bell! Trips begin in early November. Watch Santa practice for the big night on one of the biggest chimneys in the world. 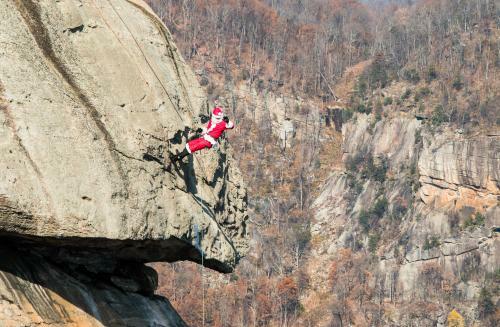 On two Saturdays in early December, Santa rappels from the top of Chimney Rock at Chimney Rock State Park. Meet him and Mrs. Claus, listen to special music and enjoy family activities. 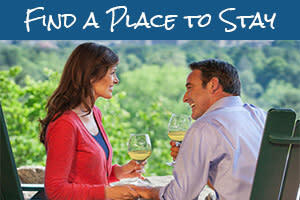 Give the gift of laughter by taking friends and family on a zany LaZoom Holiday Tour. After you board the purple bus downtown for a ride around the city, you&apos;ll never know who you might meet along the way! 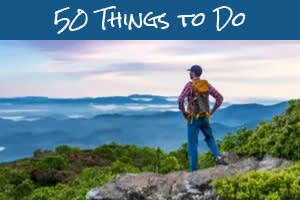 Their talented tour performers show you a hysterically, historical side of Asheville. 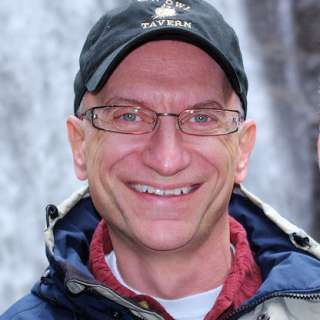 Tours run daily mid-November through New Year&apos;s Eve. 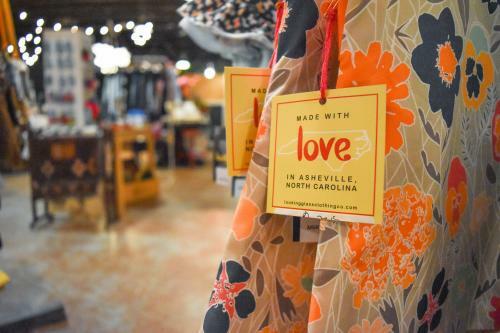 Finding that perfect gift is always more fun in downtown Asheville, especially since you can take frequent Foodtopian breaks along the way at a craft brewery or farm-to-table restaurant. 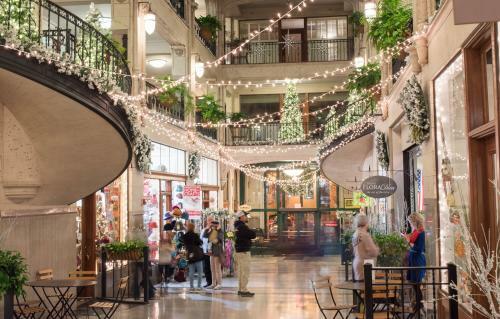 Shop inside the gorgeous Grove Arcade during its Winter Wonderland celebration, complete with a gingerbread house display. On the first Friday of the month, the Downtown Gallery Association Art Walk takes you to festivities at 20+ downtown galleries. And, check out the Big Crafty indie market with local food, beer, music and juried artists. Downtown&apos;s Holiday Parade kicks off the season early on. Just a few miles from downtown is the River Arts District, home to 180 artists in 25 buildings along the French Broad River. Many galleries and studios are open daily. The first Saturday in December, Riverview Station has a Holiday Market with 40 artists and 20 open studios. Second Saturday in RAD gives you a closer look at the creation of art with dozens of other artists opening their studios. Speaking of shopping for art, a local favorite is the annual Guild Artists&apos; Holiday Sale at the Folk Art Center on the first two Saturdays in December. Get deals on overruns, discontinued stock and studio seconds directly from the artists. While shopping is always a treat in the historic Biltmore Village, it&apos;s even more fun during their Old Fashioned Dickens of a Christmas Festival on the first weekend of December with luminaries, tree lighting, strolling carolers, roasting chestnuts and horse drawn carriage rides. Plus, find special sales at the dozens of boutiques and galleries. Santa on the Chimney photo courtesy of Chimney Rock at Chimney Rock State Park.